Heat oven to 325°F. Place pie crust in 9-inch glass pie plate as directed on box for One-Crust Filled Pie. In large bowl, beat corn syrup, sugar, butter, vanilla and eggs with wire whisk until well blended. Reserve 2 tablespoons chocolate chips for topping; stir remaining chips and 1 cup cashews into corn syrup mixture. Pour into crust-lined pie plate, spreading evenly. Bake 45 to 55 minutes or until pie is deep golden brown and filling is set, covering crust edge with strips of foil after 15 to 20 minutes of baking to prevent excessive browning. Cool completely, about 2 1/2 hours. Meanwhile, cover cookie sheet with waxed paper. In small microwavable bowl, microwave reserved 2 tablespoons chocolate chips uncovered on High 45 to 60 seconds or until chips can be stirred smooth. Dip each whole cashew into chocolate; place on cookie sheet. Refrigerate until chocolate is set, 15 to 20 minutes. 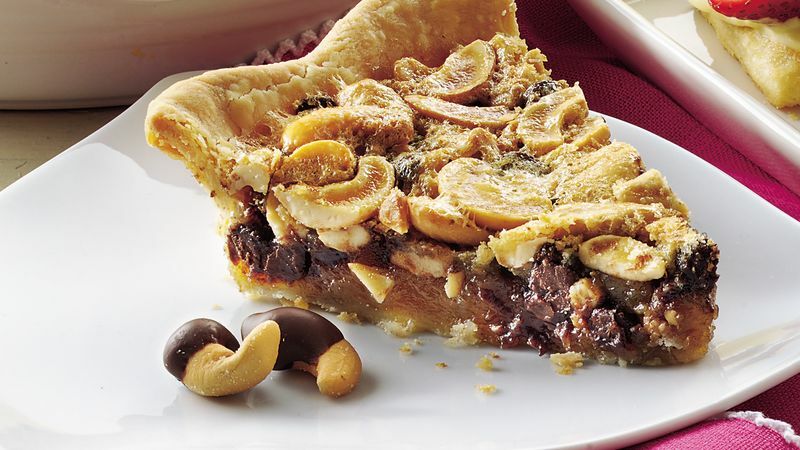 Just before serving, garnish pie with whipped cream and chocolate-dipped cashews. Cover and refrigerate any remaining pie.